Todd Troester ’15 has been building connections and helping others his entire life. Recently, his passions have led him to a kind of social activism, one that involves a lot of listening and just as much community building. 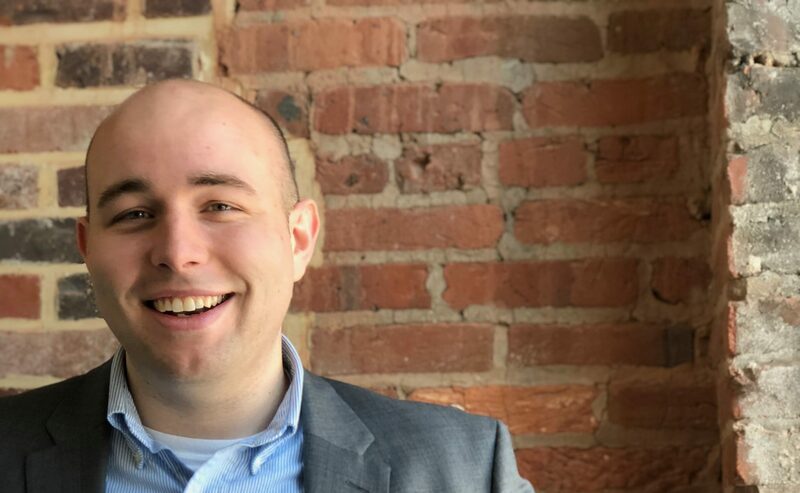 The alumnus works at the Baltimore Station, a residential treatment program supporting veterans who are battling the cycle of poverty, homelessness, and substance use issues. His work includes managing community outreach and food services. Troester also supervises a volunteer community of over 2,000 members, who take time out of their lives to cook meals, mentor, and teach art, yoga, and tai chi to the veterans at the Baltimore Station. Troester’s activist role began long before he started at Goucher, although the college’s Environmental Studies Program and involvement in the Baltimore community is what drew him to campus. Before Goucher, he earned an associate degree at Chesapeake College, where he immersed himself in student government and LGBTQ activism while working as a chef in farm-to-table restaurants. When he began to look for a college for his bachelor’s, Troester wanted to be a part of something bigger—and although Goucher may not be a large school, it’s certainly doing big things. “So it kind of fit. I like being on the ground floor of things and being a trailblazer. It always just excites me to be able to build things, and because Goucher was building the Environmental Studies Program, it was meant to be,” Troester said. Coming in as a transfer student wasn’t a problem for him, Troester added, because he’d already lived a lot of life and didn’t feel that he was missing first-year and sophomore experiences. “But for those who might feel a little differently, don’t get hung up on those first two years, just jump in and just start making connections and experiencing the things that you want to experience,” Troester said. He certainly did. As president of Goucher’s Ag Co-op for two years, the club raised over $28,000 that went toward laying down topsoil, building fences around the garden, and putting in the water catchment system. Along with Associate Professor Gina Shamshak and several key members of Ag Co-op, Troester helped rebuild a prototype of a hydroponic system in the greenhouse to make it fully operational. Shortly following graduation, Troester worked for a year at Therapeutic Alternatives of Maryland (TALMAR), where he taught a beginner farmers training program tailored for veterans with PTSD and traumatic brain injury. Within that training program were two residents from the Baltimore Station. “So I got to know about the Baltimore Station through them, and just kind of fell in love—one of those it-was-meant-to-be situations,” Troester said. He helps not only veterans but also the volunteers who at some point have had misconceptions of treatment centers and homeless facilities, thinking that it’s a “prison-like environment,” Troester said. But as soon as people walk into the Baltimore Station, those misconceptions are reversed, and volunteers see these men as not just homeless veterans but also as fathers, brothers, and sons, he said. Many of the veterans have their bachelor’s and master’s degrees and have had successful careers in and out of the service, Troester said. “It’s just at some point in their lives, trauma from service reemerges and they’re not equipped to handle it.